The C & I have reported that the financial, automotive, pharmaceutical and construction industries will be hardest hit during 2009. This was the finding of the EIBTM 2008 Industry Trends & Market Share Report which was written by Rob Davidson, University of Westminster business travel and tourism senior lecturer. As he states that you can’t fire 20 managers and then take another 20 managers on a 5 star trip to Monaco. But there is a big BUT …. he also foresees that companies who are restructuring would hold more meetings and conferences to get the key messages out to employees. I would share this prediction as we are seeing a large rise in events that are team building, almost energisers that will run as part of a meeting or conference. 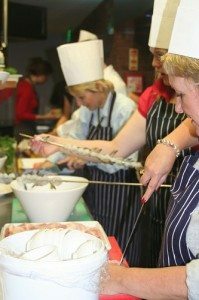 Then there is the hugely popular corporate cookery events that can be added onto smaller conferences and meetings. 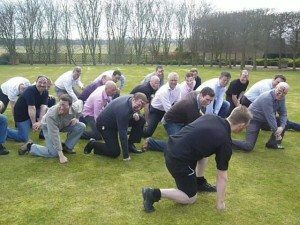 We find that, at Â£125 pp, which includes the entire team building event plus the food and the drink…represents fantastic value for money. 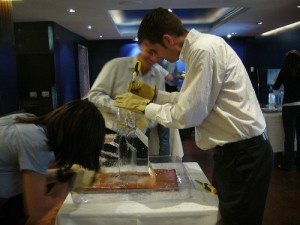 Ice Carving is another quick energiser as part of a conference, meeting or incentive. This events lasts approximately 1.15 minutes and is highly rewarding for the participants to see a lump of ice be sculpted into a horses head within 30 minutes. Okay, admittedly some do look like donkeys but the idea is there! I could go on for ages about different ‘add-on events’ but this article was an interesting read. A rise in short lead-in times for events, corporates, he predicts will need to ‘do more with less money’. Also they may look to hold overseas events in the UK which is no bad thing. The British economy needs the money for sure! Well, look no further than Team Tactics as we always try to find the right event for the chosen brief and we have a huge amount of cost justifiable events to offer clients!